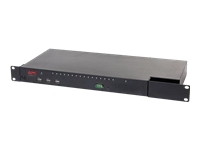 Tripp Lite's 16-port NetDirector Cat5 IP KVM Switch is the optimal solution for remotely controlling multiple computers(combination of PS/2, USB and Serial) by up to 5(1 Local and 4 Remote) independent, simultaneous users. Both DVI and VGA console ports are included for connection of either a DVI or VGA monitor. High video resolution: up to 1920 x 1200 @ 60Hz - 24 bit color depth for the local console; up to 1920 x 1200 @ 60Hz with 24 bit color depth for remote sessions at up to 164 ft.(50 m). A full-screen graphical OSD with multi-level authentication(Super Administrator, Administrator and User) allows you to quickly and efficiently manage your installation, and can be displayed in English, German, Russian, Japanese, traditional Chinese and simplified Chinese. 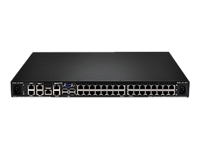 Critical events on the installation can be tracked via email notification, SNMP traps, the Windows-based log server or Syslog server. Accessing the connected computers is a breeze; view multiple computers at the same time using panel array mode, automatically sync USB mice, access the on-screen keyboard feature in numerous language formats. 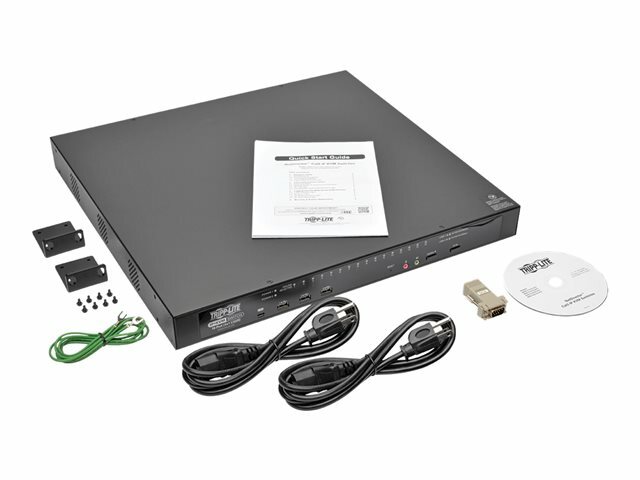 Virtual Media allows computers connected using a B055-001-USB-V2 Server Interface Unit to access DVD/CD drives, flash drives and other storage media as if they were directly connected to the computer. In addition, three USB ports are located on the front panel of the unit for use with Virtual Media or an external keyboard and mouse. 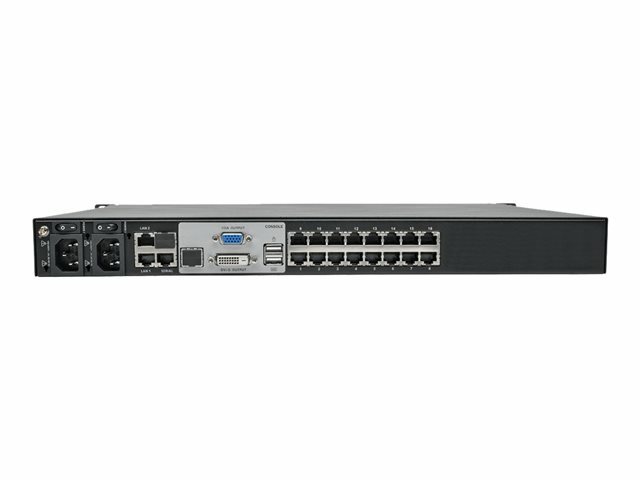 Also located on the front of the KVM is a USB Mini-B port that allows for direct connection of a laptop for easy console operation of the switch. 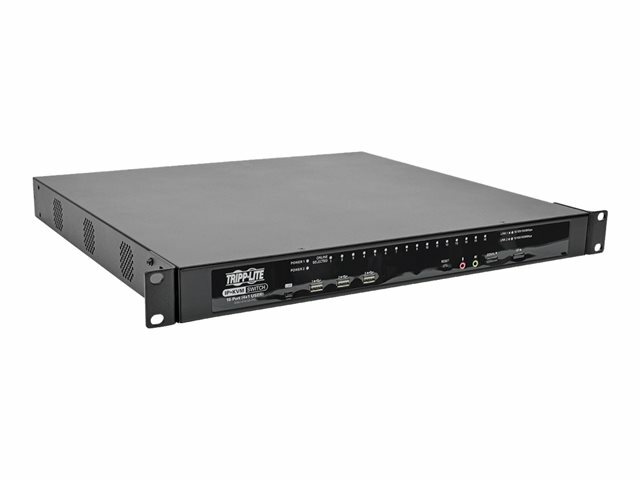 Other features include FIPS 140-2 level 1 security standards support, dual power supplies that allow the unit to continue running in the event one power supply stops receiving power, temperature sensors that control the speed of the unit's cooling fans, remote authentication support via RADIUS, LDAP, LDAPS and Active Directory, dial-in modem access and non-browser access using Windows and Java applications. Constructed of heavy-duty steel housing.